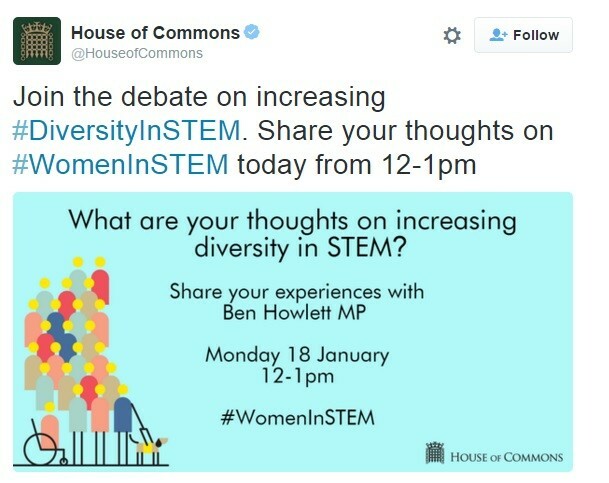 #WomeninSTEM was trending today on Twitter, due to a debate with the House Of Commons and Ben Howlett MP (Bath, Conservative) on diversity in STEM. Tomorrow , Tuesday 19th January between 4.30pm – 5.30pm, Ben Howlett MP will be discuss increasing diversity in STEM careers. Ben will point out that disabled people and minority groups are underrepresented in Science, Technology, Engineering, and Mathematics-related employment – he will be calling on the government to draw up a strategy to tackle what he calls a huge imbalance. You can watch the discussion live via ParlimentTV.